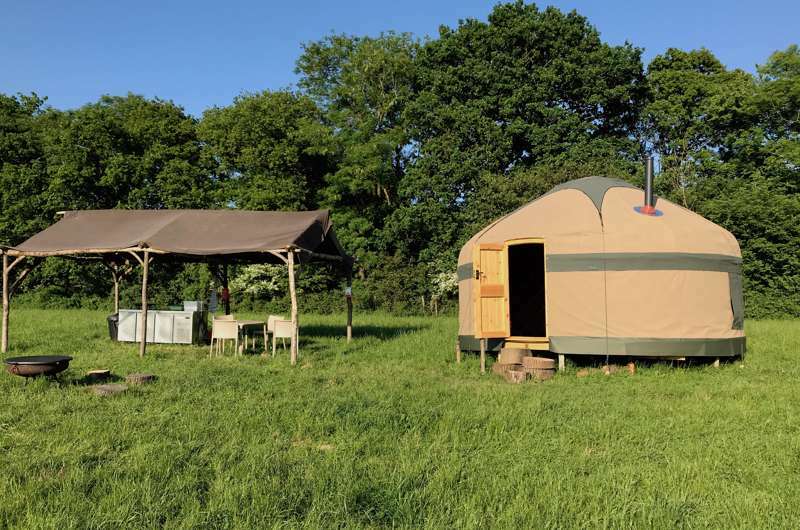 Following on from its successful stint in Kent, picture perfect pop-up Freedom Camping returns to an arguably even more spellbinding location in a tranquil corner of West Sussex. 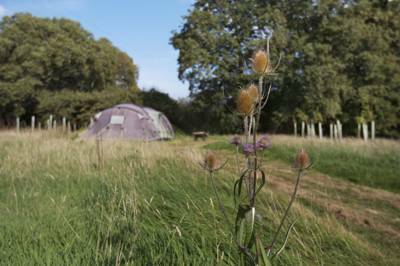 This secluded field in the heart of West Hoathly marries wild camping with style and luxury in a refreshingly uncommercial setting. This new location is truly off grid, offering the chance to digital detox and get back to nature. 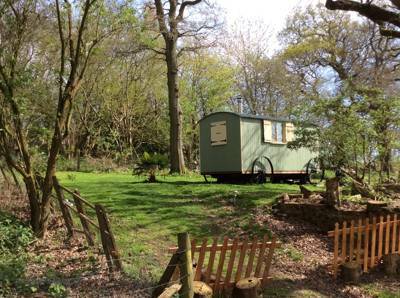 There are no permanent buildings on site, no main roads, and with a backdrop of enchanting woodlands, this is the perfect retreat from bustling city life, being less than an hour by train or track from London. Five bell tents are spread around, each with memory foam mattresses and bedding, while a scattering of rugs, cushions and bunting give them a chic feel. Lanterns and lights festoon the tents and tea lights can be lit for some romantic outdoor lighting. Campfires are also a must, with logs and firepits provided. Such is the stylish charm of the Freedom set-up, they’ve also started taking on vintage-inspired weddings. So if you fall in love beneath the stars you could always pop back again for the big day. Venture forth from the site and the delights of West Sussex unfurl before you. The best way to explore the surroundings are from the carriages of The Bluebell Railway, a gorgerous period locomotive which steams through the county's idyllic fields and valleys. Arundel Castle; Ashdown Forest; Sheffield Park – the latter the inspiration for A.A. Milne's '100 Aker Wood' – there's a plentitude of great days out to be enjoyed. 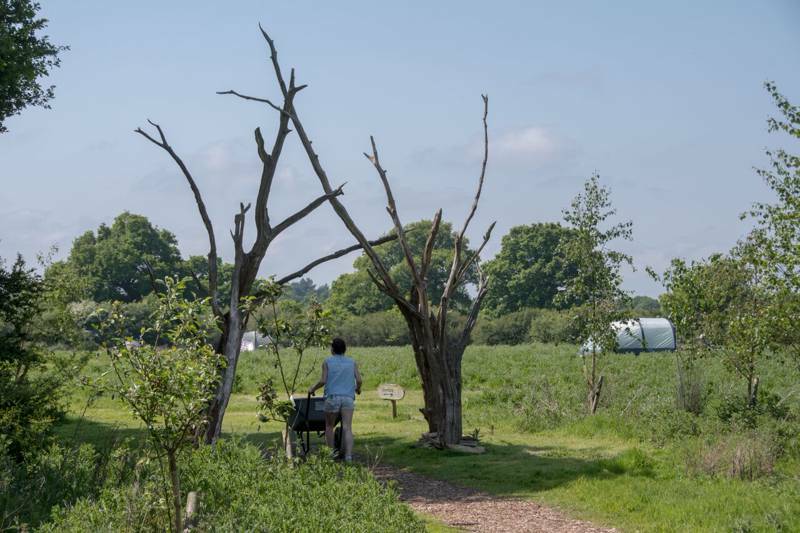 But with wild deer on site, nearby farm shops stocked with the finest local produce, and a roaring campfire to cook on back at site, the spirit of Freedom Camping may prove so alluring that you never even bother leaving the fireside! 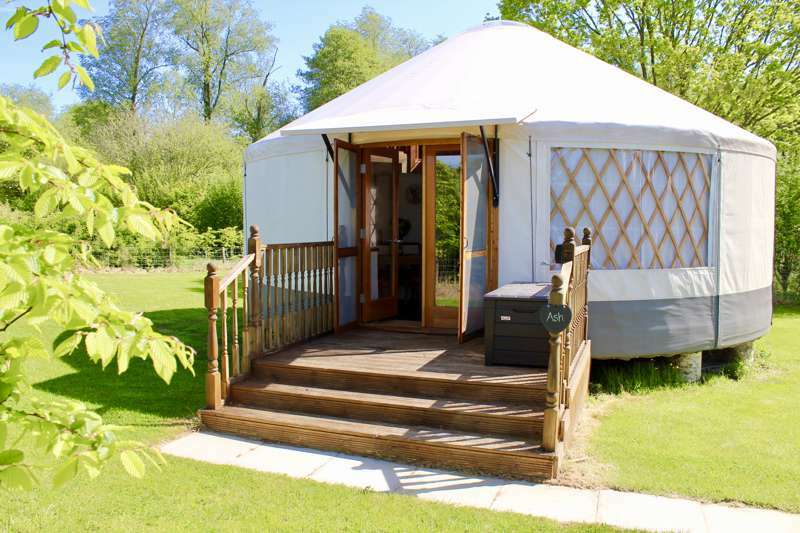 A pop-up glamping site in in a tranquil corner of West Sussex. At Freedom Camping, we believe in enjoying the outdoors surrounded by quality, comfort and style. 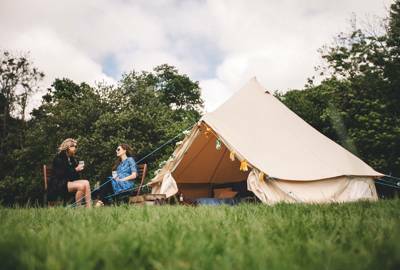 We offer pre-pitched tents complete with all luxury camping essentials such as beds with fresh linen, rugs, lighting and other homely touches. 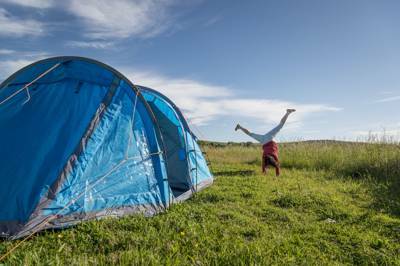 By removing the pre-planning and labour to set up camp, you can enjoy the best things about camping without any stress. Outdoor enthusiasts can experience nature without the hassle. Our set ups combine camping with the luxury of home comforts, allowing you to unplug, spend precious time with family and friends, unwind and get back to nature without having to rough it, and feel exhausted by the end of the trip. 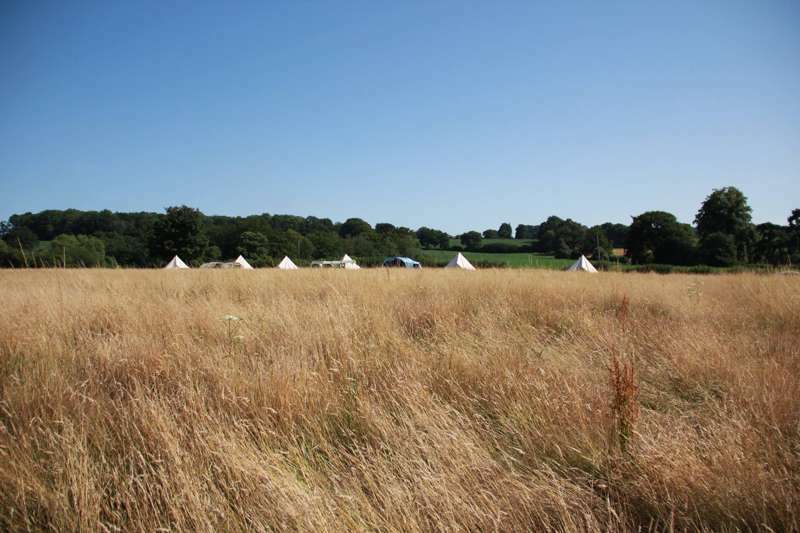 2 x 4m bell tents (sleeping up to 4), plus 2 x 5m bell tents (sleeping up to 5). 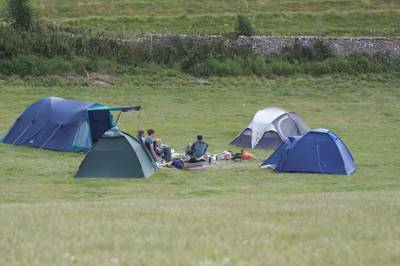 All tents have a double bed (memory foam mattress, bedding and linen), additional air beds, cutlery, crockery and utensils, indoor and outdoor lighting, cushions, rugs, throws and chairs. The site facilities are simple, with water taps and toilets. Firepits and wood available. Sussex has no end of attractions – from the rural idyll of its Weald and innumberable chocolate-box villages; to the storied stone steps of Rye; to the bright lights of boho Brighton. But the very heart of the region is West Hoathly and its surroundings. Hop aboard The Bluebell Railway (01825 720800) at East Grinstead to soak up the sites of this Area of Outstanding Natural Beauty. The Capability Brown-designed Sheffield Park (01825 790231) is the end destination, and there are plenty of other leafy leeways to get lost in, like Wakehurst Place (01444 894066) and in particular Ashdown Forest (01342 823583) which also boasts a sailing and canoeing centre (01444 892549). 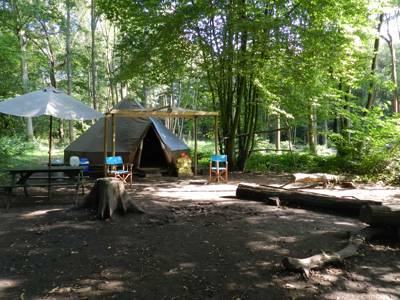 Elsewhere, Deers Leap Park (01342 325858) is over 240 acres and jam-packed with great outdoor activities such as archery, bushcraft and falconry. Further west to neighbouring Dorset, Priest's House Museum & Garden (01202 882533) offers a fascinating glimpse into the local history in an atmospheric Grade II listed setting. There's a handful of lovely pubs in the area. The Gardeners Arms (01444 892328) is the go-to destination for casketeers. Run by Hall and Woodhouse, one of the few remaining regional family brewers, and purveyors of award-winning Badger beers. The Cat Inn (01342 810369) is a great gastro thats a leisurely stroll from the site and boasts an inventive menu of locally-sourced dishes. The Vinols Cross Inn (01342 810644) promises a friendly welcome and a well-stocked bar. June 9th - Sept 14th. 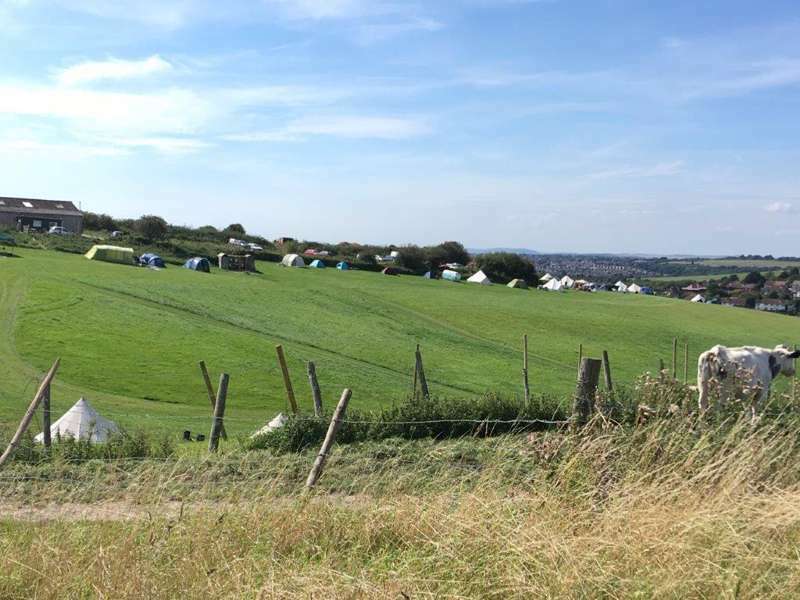 Bell tents (includes 2) £100 per night, plus £20 per extra person (minimum 2 people required to book and minimum 2-night stay). August Bank Holiday is minimum 3 nights (Fri-Mon). Nestled a short 45 minutes drive from South London, and 37 minutes (9 stops) via train from East Croydon this site is easily accessible without a vehicle. Freedom offers a free shuttle service available from East Grinstead station. Please book in advance.